The COOLPIX L32 makes taking great photos and videos a breeze! Want better selfies or photos of friends, family and even pets? Use the Smart Portrait System and let the COOLPIX L32 do all the work. Want better videos? Press the dedicated Movie Record button and capture 720p HD videos with sound. You can even zoom in while you're recording—electronic Vibration Reduction will help keep your videos steady. Easily preview fun Image Effects on the camera's large 3.0-inch LCD, apply your favorites and then show off to your friends. You won't even have to wait for a charge—the COOLPIX L32 runs on regular AA batteries! 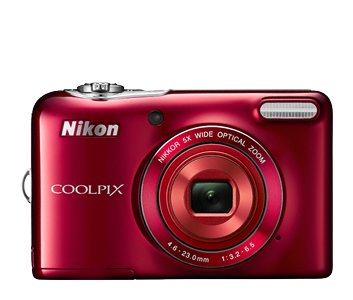 The COOLPIX L32 is all about ease—just point, shoot and enjoy your great photos and videos. When you want to record videos, you don't have to turn any dials or flip any switches—just press the dedicated Movie Record button. And when you want to add fun effects, the COOLPIX L32's simple menu system makes it a breeze. Every COOLPIX is designed around a genuine NIKKOR glass lens, the legendary optics that have made Nikon famous. The COOLPIX L32's 5x Zoom NIKKOR lens is great for everything from wide-angle group shots to close-up portraits. Plus, Electronic Vibration Reduction helps keep every video steadier, even if your hands are not. Turn ho-hum portraits into glamorous head shots. Glamour Retouch softens skin tones, hides dark circles—even adds some rosiness to cheeks. Your friends and family will love the photos you take of them. The COOLPIX L32's large, 3.0" LCD display makes it easy to compose your shots or monitor your video recording. Reviewing and sharing your creations is a pleasure, too—every shot looks fantastic on the display. Wondering how that photo would look in black & white? As an artistic illustration? Easily preview a selection of fun Quick Effects on photos you’ve already taken, then save your favorites alongside the original. The COOLPIX L32 is powered by Two AA batteries, which are convenient to use, and widely available. It accepts alkaline, lithium and Nikon rechargeable batteries, available as an optional accessory.